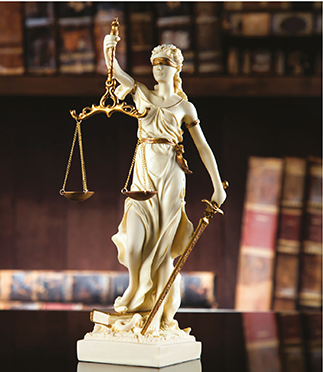 ‘Lady Justice’ has three distinct representations: a sword to depict power, scales to show the weighing of evidence and a blindfold reflecting impartiality. However, Lady Justice occasionally adopts a different strategy in Sri Lanka, wielding her sword to defend the rich and tipping the scales in favour of the powerful. As for the blindfold, some of her actions in Sri Lanka have given the expression ‘justice is blind’ a whole new meaning! Proponents of good governance may argue that there has been a marked improvement in the rule of law recently. For example, Sri Lanka climbed nine spots to 59th place in the most recent Rule of Law Index published by the World Justice Project, ranking second in South Asia (behind Nepal) and sixth among lower middle income countries. While this is to be applauded, focussing on a single ranking is insufficient to fully comprehend the status quo. Even in the index, Sri Lanka’s performance in certain criteria such as civil justice is appalling; it ranks 91st in the world – that’s below China, Russia, Iran and Uganda. A glance at statistics published by the Department of Prisons reveals the sorry state of affairs today. Last year, Sri Lanka’s prisons housed almost 95,000 un-convicted prisoners awaiting trial, accounting for 80 percent of the prison population. At the end of 2016, there were more than 700 un-convicted prisoners who had spent over two years awaiting trial – and 149 of them had spent over five years. These individuals have fallen through the cracks with limited avenues available to address their grievances – despite the Bail Act stipulating that the maximum time a person can be held in remand is two years. The bitter truth is that whilst corrupt politicians and robber barons thrive in our country, these un-convicted prisoners are considered ‘guilty until proven innocent’ and rot away in prison for years before facing trial. To be fair, the government has engaged in judicial reform to a certain extent. For example, the Constitutional Council was authorised to approve the appointment of key judicial officers such as the Chief Justice. A review of the judiciary was also conducted by the Constitutional Assembly’s Subcommittee on the Judiciary. However, this provided little in terms of recommendations for checks and balances, and grievance procedures for citizens affected by judicial malpractice. An independent judiciary alone is inadequate unless steps are taken to increase efficiency as well. To do so, Sri Lanka needs to urgently address the dearth of judges in the country. As reported by the World Bank in 2013, Sri Lanka has a ratio of a mere 1.5 judges for every 100,000 citizens, which is less than half that of countries such as Australia (4.4) and Thailand (6.8). With judges being overextended, it isn’t surprising that in September 2016, there were almost 750,000 pending cases across the courts. In addition to addressing the dearth of judges, more emphasis needs to be placed on providing better training for the few judges available in the first place. For example, the World Bank points out that there were no courses on commercial law at the Judges Institute as recently as 2013, which is farcical to say the least. Another potential solution to increasing the efficiency of the judiciary is to follow countries such as India, Japan, Malaysia and South Korea by implementing an e-court system as proposed by the justice minister last year. Today, South Korea saves US$ 221 for every e-filing and it takes an average of 290 days to resolve a contract enforcement dispute in that country compared to 1,318 days in Sri Lanka. Our judiciary is in urgent need of reform. It is high time we embrace Lady Justice in her original form because an independent and efficient judiciary are vital elements in Sri Lanka’s path to prosperity. If the innocent are proven guilty and sent behind bars, if the wrong proponents are roaming joyfully and freely, if status and power are ruling justice and law, then lady justice is blindfolded, blind to act against wrong. Sentiments of the law have not been the way they should be. This has then spread and influenced the structure of the judicial system, thus indicating that the law in the country seems to not be standing on strong roots. People are compelled to wait perhaps donkey’s years seeking the justice they deserve, be it a trivial issue or not, or for an appeal when the settlement does not seem reasonable. Due to the dearth of capable judges, sometimes people are taken for a ride and exploited by some lawyers for monetary gains to prolong cases despite these attempts being considered futile. Such major issues need to be addressed and overcome prior to considering an e-system, which needs much transparency too. The rule of justice simply cannot be judged with the improvement of applicable indices and rankings. Achieving progress that can be sustained should be a key concern. As indicated, impartiality speeding up hearing processes, effective judgements by judges who possess the capacity to do so, and avenues and equal access for proper grievance handling are some of the vital determinants that will rank the productivity of Sri Lanka’s judicial system. In terms of the low ratio of 1.5 judges for every 100,000 citizens in Sri Lanka, improvement should also pay attention to broadening the capacity of the judges, enabling them to acquire insights in a more focussed approach. This way, the probability of judges being better equipped to effectively handle a wide a range of hearings would be higher. Until such time, ‘guilty until proven impartial’ – Sri Lanka’s justice will be truly blind to what should be eye-openers.